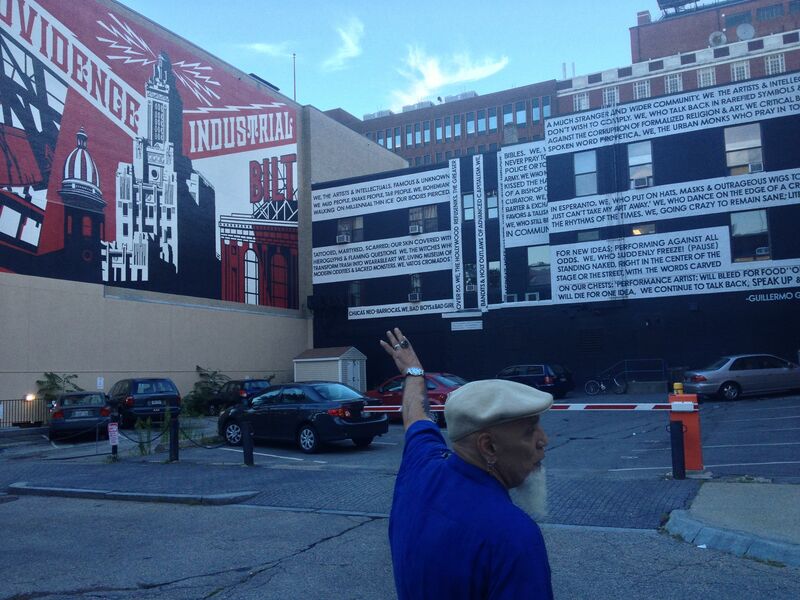 Is Social Practice Gentrifying Community Arts? “Is Social Practice Gentrifying Community Arts?”: This question posed by Rick Lowe of Project Row Houses in conversation with Nato Thompson at this years Creative Time Summit, Art, Place & Dislocation in the 21st Century, was a crystallizing moment in a series of gatherings and convening I’ve been part of the last few months. 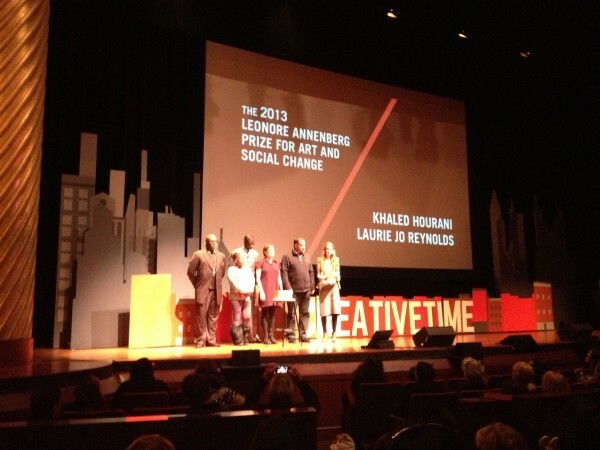 Addressing “gentrification,” the thematic buzz word of this year’s Creative Time convening, Lowe said that to really talk through the issue of gentrification, we must also address our issues with race. As he put it, communities of color are talking about race all the time as part of inescapable component of everyday experience, whereas conversations with white people results in a sort of “shadowboxing” in which one dances around the issue without addressing it head-on. To illustrate, he brought up the media coverage around the Trayvon Martin/George Zimmerman case in which Juror B37 said on Anderson Cooper that the case had nothing at all to do with race, a sentiment echoed by many commentators in our mainstream media outlets. This in stark contrast to the conversations he was having (as many were) where race was the central issue in how that case was tried and decided and which had vast implications for communities of color. And how does this play out in the cultural context of presenters at the Creative Time summit? Well, for place-making initiatives, another buzzword running through many Creative Time presentations, he cautioned that we must be careful to not obfuscate what is really at stake. It’s easy for well-meaning place-makers and artists to reach out to places in need, it’s a lot harder to reach the actual people because, understandably, not everyone wants to join the vibrancy index. As arts advocateÂ Roberto Bedoya pointed out in his presentation, place-making has a colonizing history as well, lest we forget Japanese internment camps during World War II, the Chinese exclusionary act of 1882 and the current militarization of the border near where he lives in Arizona. In addition to that, strategies of community engagement and participatory art have a long history in community arts, albeit with an explicit social justice mission that is often missing in the language around creative place-making today. Recent social practice MFA-ers and platemaking gurus be warned, these strategies have long been employed by the field of community arts, and though they may not fit all the current buzzwords we would do well to heed their experiences. Not to knock MFA-ers because students deserve the generosity of being taught without always being criticized for their naivete, but the Creative Time Summit shows that there is a startling shift in the field where socially engaged artist initiatives (student ones as well) are walking the walk and talking the talk of community arts, without necessarily the community investment or social change mission. As RisÃ« Wilson, founder of The Laundromat Project and moderator of the “My Brooklyn” panelÂ at the summit,Â says, race is also a question of power and privilege. And if, as she asks, our larger goal is social, political and economic equity, then we each must ask ourselves, what is our privilege and what would we be willing to give up in the name of that equity? How does the often explicit social justice mission of community arts and grassroots political organizing square with contemporary artists, seeking to be relevant outside the arts and inside “communities” while at the same time retaining authorship and cultural capital at the same time? And for the MFA student, with their rising cost of education, crippling debt, and precarious jobs waiting on the other hand, the less advantaged are often not the ones inside schools getting to know those buzzwords to leverage those new opportunities for funding. 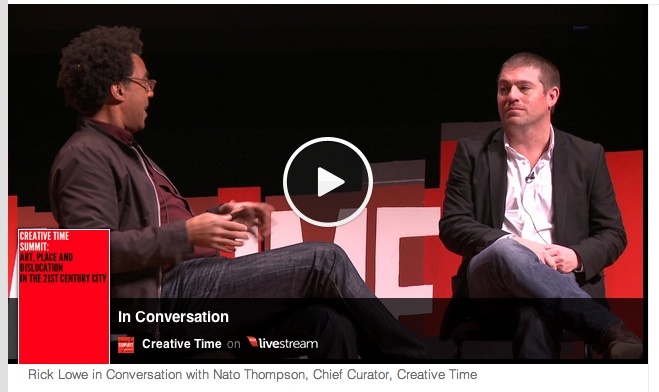 The Creative Time Summit has a “big tent” solution to bridging these divide. In other words, if you place all these working methods alongside each other, then maybe a new audience is articulated that sees cultural work outside of disciplinary silos and finds ways to talk to each other. And I’m not the biggest fan of TED Talks eight minute format but there is an agenda smuggled in there that I recognize, in which Creative Time occupies an interesting, contradictory, paradoxical position between the people in the grassroots arts and social justice sector and those in power and tries to act as a pipeline between those worlds. In other words, the TED Talks are an amplification technique to make these complex projects accessible. One can debate whether or not that should be the goal, but it’s also a goal worth addressing. For instance, this year’s Leonore Annenberg Prize For Art and Social Change of unrestricted funds, whichÂ was awarded to the well-deserving Laurie Jo Reynolds/Tamms Year Ten and Khaled Hourani, also comes with a think-tank retreat facilitated by Creative Time and the Annenberg Retreat at Sunnylands that will bring together policy-makers, lawyers, other artists, philanthropists, to discuss how to work towards solving the issues of injustice that these artists address. So along with the ceremony and pizazz of the summit, Creative Time is also engaging in our other form of contemporary power-broking, the invitational retreat.Â President Barack Obama himself hosted President Xi Jinping of the People’s Republic of China for an official working meeting at Sunnylands last June. What will result from there remains to be seen, but it is clear that scaling-up these political art projects is the goal. Unfortunately what also results from such a tactic of accessibility at the actual summit is that often presentations slide into pitch mode, in which social good is promoted, great work is being done, and we can all go home inspired. But admittedly, I actually was inspired by some of the presenters. Lucy Lippard, Torolab, Antanas Mockus Å ivickas, Tamms Year Ten crew, to name a few, are totally amazing. And there were some confusing bits too. I was looking for some substantiative connections between documentary activism and socially engaged artist projects on the “My Brooklyn” section and the “Flaneurs” panel was an odd mismatch of projects. But I assume, this is all about throwing people together and seeing what sticks. So why do we need all these entrepreneurial sales pitches? Why is Creative Time one of the only ones out there madly facilitating between all these huge gaps? Or are they the only ones thinking big? I’ve been thinking through these questions of diversity and relationships between socially engaged art/place-making rhetoric of today and community art’s history through two other recent gatherings that I’ve also been a part of. In August of 2013, I moderated a panel atÂ The Association of American Cultures conference (TAAC) in Providence, RI and in October 17-20, I spoke on a panel as part of the second Hand in Glove conference, which I co-founded with many others in Chicago in 2011, this time in New Orleans and organized and hosted by Bob Snead ofÂ Press Street/Antena GalleryÂ and his team. TAAC was founded in 1985 on the values of multiculturalism and social equity in the arts and today by and large encompasses culturally specific community arts organizations, as well as the funders and arts councils that seek to support them (there is a summary of the proceedings here). After a three year hiatus, they are gathering again as a national dialogue and much of that conversation was about that issue of redefining multiculturalism for a 21st century audience. The logic goes, multiculturalism brought new voices to the table through the 1990s, but at this point, who’s table is it? What is the fate of the community arts and cultural specific institutions when the dominant language of creative economies and creative place-making are telling them to innovate or die? At these different kinds of gatherings, I am fascinated by the similarity of languages that are now used across contemporary art gatherings and nonprofit community arts. For instance, one of the activities of TAAC was a walking tour of downtown Providence with the founder of AS220, Umberto Crenca. Founded as a one-room alternative space in 1985, AS220 has played a major role in the revitalization of downtown as a cultural district, encompassing multiple buildings with small-business incubators, artist live/work spaces, youth programs including for those in custody of the state, a gallery, music space, and its own bar and restaurant. It’s staggering what they have been able to accomplish, all the while paying all full-time workers (including the Executive Director) the same salary and sustaining themselves for many years without major foundation support. But also their goals of downtown expansion have been able to align with the rhetoric around creative economies. Closer to home, it’s hard not to draw comparisons between a project like this and Theaster Gates’ Rebuild Foundation, both led by charismatic hometown boys with goals of social empowerment and benevolent capitalism while drawing their entrepreneurial chutzpahÂ from radically different traditions and being held up as success stories by different venues. Is this a time for that big tent? What about those that don’t have such a great sales pitch? 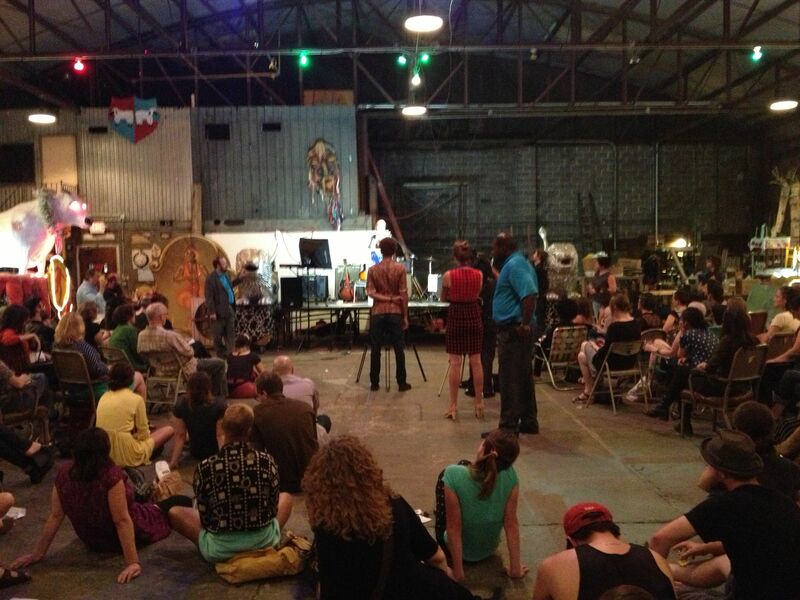 In New Orleans atÂ Hand in Glove, a gathering of artist organizers and artist-centered non-profits addressing at the national level the pragmatic and conceptual challenges faced by alternative spaces and artist-run initiatives, a similar question of ambiguity and belonging emerges. Who sees themselves as part of this particular conversation? What do artist-run galleries, socially engaged artist platforms, and nonprofits have to say to each other? And what about community arts, are they part of our field as well?Â When Hand in Glove met in New Orleans to hold panel discussions on ways of organizing and sustaining ourselves on October 17-20, Free Southern Theater Â (one of the most amazing socially-engaged artist organized projects of all time)Â was also having their 50th anniversary gathering that same weekend. Our gathering was amazing, generative community-building and too complex to go into here, but for the context of this musing on bridging the divide, I found myself questioning if there was some substantiative way of bringing the worlds of Hand in Glove and Free Southern Theater together to talk about what’s really at stake and how to support the work of artists that are truly challenging and experimental in form. That in addition to acknowledging the legacy and knowledge of my own field. I’m looking for too much I realize, but as our Hand in Glove group is interested in building national networks around arts organizing and bringing in a diverse set of practitioners and we can see the disciplinary boundaries become shifting ground between our feet, we have to ask what we share with these other traditions and where do we diverge. We owe it ourselves, especially at places like the Creative Time Summit, at Hand in Glove, at TAAC, to not merely applaud our efforts but to actually challenge our own terms. As part of a recent symposium on the legacy of Culture in Action, artist Daniel Joseph Martinez commented that two heydays have passed: the alternative space and the culturally specific institution and with that an alternative life course for the non-commercial artist. This is admittedly hyperbolic, but I think what he was getting at was that there was a certain moment when operating outside of the mainstream was a viable choice and a great promise, and then the Culture Wars hit big and in a way we’re still recovering. With the steady encroachment of the razzle-dazzle of place-making, creative economies, and social practice, we’re in a moment where seemingly alike projects get radically different receptions and resources, legacies are in danger of being overlooked, and underneath all these TED talks and success stories we need to squint really hard to find the ethos and values being articulated.